litre of new uncooked vegetable oil. blender or paint mixing kit. Biodiesel is made from vegetable and animal oils and fats, or triglycerides, it can’t be made from any other kind of oil such as used engine oil. Chemically, triglycerides consist of three long-chain fatty acid molecules joined by a glycerine molecule. The biodiesel process uses a catalyst (lye) to break off the glycerine molecule and combine each of the three fatty-acid chains with a molecule of methanol, creating mono-alkyl esters, or Fatty Acid Methyl Esters (FAME) or what is more commonly known as biodiesel. The glycerine sinks to the bottom and is removed. 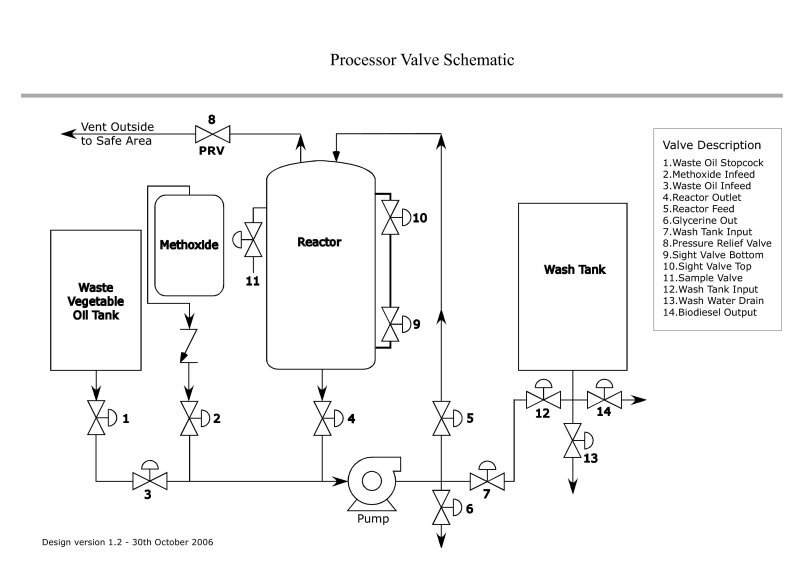 The process is called trans-esterification. Beginners should start with small, 1-litre test batches. It’s important to use the best quality chemicals from a chemicals supplies store. The initial costs may seem higher, but the final results will be more conclusive. Once you’ve mastered the process then it’s time to find cheaper sources of chemicals for larger batches. The alcohol used can be either methanol, which makes methyl esters, or ethanol (ethyl esters). Methanol can be made from biomass, such as wood, but nearly all methanol is made from natural gas, which is a fossil fuel. methanol is an industrial process, there is no “backyard” method for producing it. Producing biodiesel with ethanol is more difficult than making it with methanol. Most ethanol is plant-based and you can make it yourself. Ethanol or ethyl alcohol, grain alcohol — EtOH, C2H5OH is basically whisky, vodka, or gin. It’s also called methyl alcohol, wood alcohol, wood naphtha, wood spirits, methyl hydrate or “stove fuel”. carbinol, methylol, methyl hydroxide, hydroxymethane, monohydroxymethane, pyroxylic spirit, or MeOH (CH3OH or CH4O) Methanol is not dangerous if you’re careful but must 99+% pure. 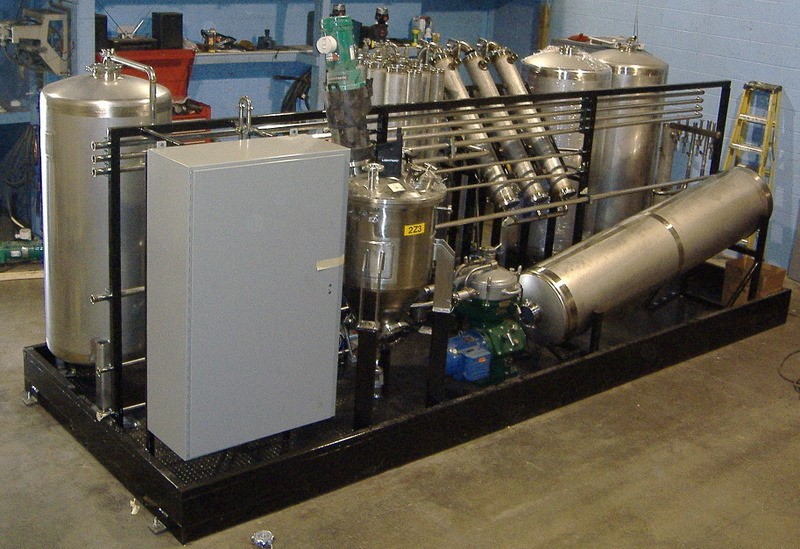 You can usually get methanol from bulk liquid fuels distributors. It’s also sold as a solvent by paint companies. Methanol is also sold in supermarkets as stove fuel for barbecues but not all “stove fuel” is methanol, it could also be “white gas”, which is gasoline. It must be pure methanol or it won’t work for making biodiesel. Methylated spirits or denatured ethanol doesn’t work either and neither does isopropanol. The lye catalyst can be either potassium hydroxide (KOH) or sodium hydroxide (caustic soda, NaOH). Always keep lye containers sealed and airtight. Both KOH and NaOH rapidly absorb moisture from the atmosphere (hygroscopic). Water makes them less effective catalysts. Either KOH or NaOH can be used in the production of bio-diesel, whether it’s the basic single-stage base method, the two-stage base-base method, or the two-stage acid-base method. NaOH is cheaper to use,but KOH is easier to use, and it does a better job — KOH is a better catalyst all-round than NaOH. KOH can also provide potash fertiliser as a by-product of the biodiesel process. Experienced biodieselers making top-quality fuel use KOH, and so do the commercial producers. With KOH, the process is the same as with NaOH, but you need to use 1.4 times as much (1.4025), and it comes in various concentrations. You can get high-quality KOH and NaOH from soapmakers’ suppliers or from chemicals suppliers. NaOH is used as a drain-cleaner and you can also get it from hardware stores. It has to be pure NaOH. Shake the container to check it hasn’t absorbed moisture and coagulated into a useless mass, and make sure to keep it airtight. Don’t use Drano or ZEP drain-cleaners or equivalents with blue or purple granules or any-coloured granules, it’s only about half NaOH and it contains aluminium — it won’t work for biodiesel. With used oil, titration with NaOH to check the acid content has become the de-facto comparative measure of different oils — whether they use NaOH or KOH in their processing, when describing oils most biodiesel brewers refer to however many millilitres of NaOH solution is needed to titrate the oil. Most commercial cooking oils contain additives, usually preservatives such as TBHQ (Tertiary Butyl Hydroquinone) or citric acid, and silicone (dimethylpolysiloxane), an anti-foaming agent. These additives are not a concern, they have no effect on the biodiesel process or the quality of the fuel. You need to be quick when measuring out the lye because it rapidly absorbs water from the atmosphere and water interferes with the biodiesel reaction. Measure the lye out into a handy-sized lightweight plastic bag on the scales (or even do the whole thing entirely inside a big clear plastic bag), then close the lid of the container firmly and close the plastic bag, winding it up so there’s not much air in it with the lye and no more air can get in. Have exactly the same kind of bag on the other side of the scale to balance the weight, or adjust the scale for the weight of the bag. NaOH must be at least 97% pure, use exactly 3.5 grams. With KOH it depends on the strength. If it’s 99% pure (rare) use exactly 4.9 grams (4.90875). If it’s 92% pure (more common) use 5.3 grams (5.33), with 90% pure use 5.5 grams (5.454), with 85% pure use 5.8 grams (5.775). Any strength of KOH from 85% or stronger will work. Measure out 200 ml of methanol and pour it into the half-litre HDPE container via the funnel. Methanol also absorbs water from the atmosphere so do it quickly and replace the lid of the methanol container tightly. If you’re working at ordinary room temperature you won’t be exposed to dangerous fumes. Carefully add the lye to the HDPE container via the second funnel. Replace the bung and screw on the cap tightly. Shake the container a few times don’t swirl it round shake it up and down. The mixture will get hot from the reaction. If you swirl it thoroughly for a minute or so five or six times over a period of time the lye will completely dissolve in the methanol, forming sodium methoxide or potassium methoxide. 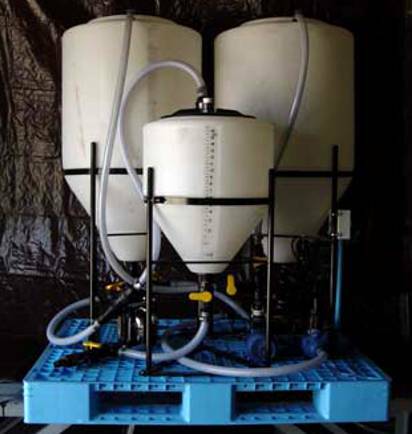 As soon as the liquid is clear with no undissolved particles you can begin the process. The more you swirl the container the faster the lye will dissolve. With NaOH it can take from overnight to a few hours to as little as half-an-hour with lots of swirling wait for ALL the lye to dissolve. Mixing KOH is much faster, it dissolves in the methanol more easily than NaOH and can be ready for use in 10 minutes, with five or six shakes it takes about half an hour. Use a spare blender you don’t need or get a cheap second-hand one — cheap because it might not last very long, but it will get you going until you build something better. Check that the blender seals are in good order. Make sure all parts of the blender are clean and dry and that the blender components are tightly fitted. Pre-heat the oil to 55 deg C (130 deg F) and pour it into the blender. With the blender still switched off, carefully pour the prepared methoxide from the HDPE container into the oil. Secure the blender lid tightly and switch on. Lower speeds should be enough. Mix for 20-30 minutes, or longer. Proceed with processing as above, maintain temperature at 55 deg C (130 deg F), process for one hour or longer. As soon as the process is completed, pour the mixture from the blender or the mini-processor into the 2-litre PET bottle for settling and screw on the lid tightly. As the mixture cools it will contract and you might have to let some more air into the bottle later. Allow to settle for 12-24 hours longer is better. 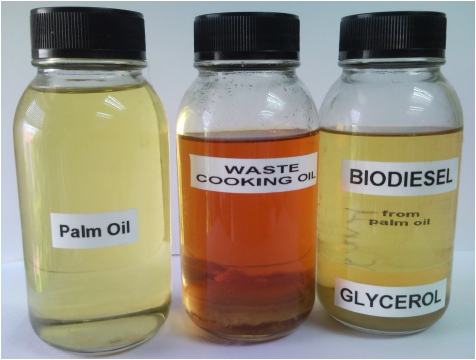 Darker-coloured glycerine by-product will collect in a distinct layer at the bottom of the bottle, with a clear line of separation from the paler liquid above, which is the biodiesel. The biodiesel varies somewhat in colour according to the oil used (and so does the by-product layer at the bottom) but usually it’s pale and yellowish (used-oil biodiesel can be darker and more amber). The biodiesel might be quite clear or it might still be cloudy, whic h is not a problem. It will clear eventually but there’s no need to wait. 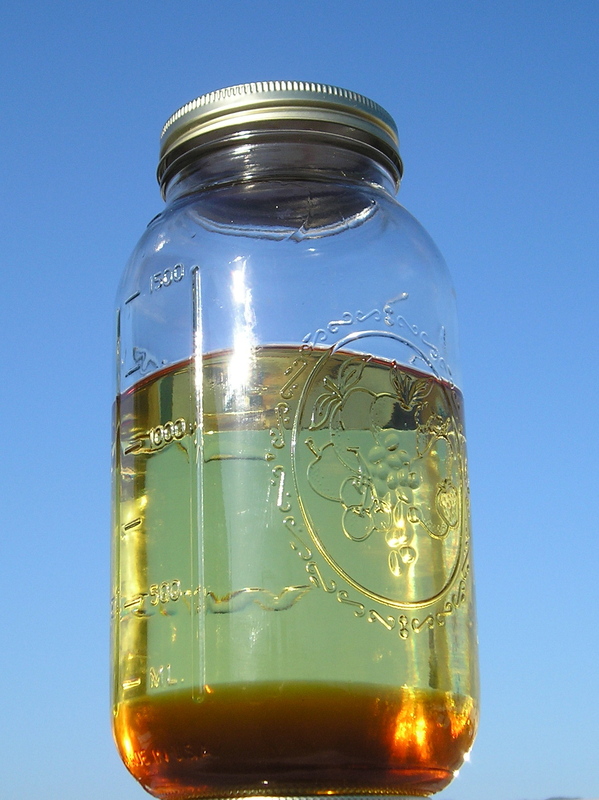 After settling, carefully decant the top layer of biodiesel into a clean jar or PET bottle, taking care not to get any of the glycerine layer mixed up with the biodiesel. If you do, re-settle and try again. Proceed to the wash test and the methanol test to check the quality of your biodiesel. If your test sample “split” and the glycerine formed at the bottom, you have already succeeded in making biodiesel. It often takes several attempts to pass the quality tests. For instance, different blenders and mini-processors have different shapes and different rates of agitation, and the processing time required for good process completion can vary accordingly. You might have to adjust it. Follow the instructions exactly. If the test sample passes the quality tests then wash the rest of the biodiesel. For washing use the two 2-litre PET bottles in succession, with half a litre of tap water added for each of the three or four washes required. Pierce a small 2mm hole in the bottom corner of each of the two bottles and cover the hole securely with duct tape. Pour the biodiesel into one of the wash bottles. Add the half-litre of fresh water. If you have a small enough paint stirrer and a variable-speed drill, cut the threaded lids off the wash bottles to accommodate the stirrer. Stir until oil and water are well mixed and appear homogenous. Settle for three hours or more. Then drain off the water from the bottom of the bottle by removing the duct tape from the hole. Block it again with yourfinger when it reaches the biodiesel. Transfer the biodiesel to the second wash bottle, add fresh water and wash again. Clean the first bottle and replace the duct tape. Repeat until finished. If you don’t have a stirrer, don’t cut the lids off the wash bottles. Add the biodiesel and the water as above. Screw the cap on tightly. Turn the bottle on its side and roll it about with your hands until oil and water are well mixed and homogenous. Settle, drain as above, repeat until finished. When it’s clear (not colourless but translucent) it’s dry and ready to use. It might clear quickly, or it might take a few days. If you’re in a hurry, heat it gently to 48 deg C (120 deg F) and allow to cool, this evaporates the remaining water, so let it ventilate.